I have read and enjoyed the many testimonies on this site and I am glad to share my experience. Many of the testimonials are very well written, I am not a great writer but hopefully my experience will help some one else. I was "saved" when I was 12 years old. Since then I have poured my life into my faith, I truly felt that I had a personal relationship with god and that he had a purpose for my life. As I got older I selected a college major based off what I thought god wanted and what I felt called to do. I also married a beautiful wonderful woman who shared my faith. I joined a church and poured all my free time into study and fellowship with others. I was asked to be a deacon of the church after about 15 years of faithful commitment to the church. Although I was young I was asked to this position because I believe I reflected a level of maturity given my devoutness and thoughtful study of the bible. I felt that if I prayed and studied that god would give me wisdom and direct me through this life and that I would serve a higher purpose. As I got older I realized that there was a ceiling to where faith can take you. I don't mean that I learned all there is to know, the bible is vast and you can study it the rest of your life and not exhaust it. What I mean is life happens and eventually you will lean on your faith and realize that there is nothing there really to hold onto but broken promises and false hope. Most people who read this thread may think something bad happened and I am lashing out at god. On the contrary, I have a good life. I'm still very happily married to my wonderful wife and I have two amazing kids and a great job. It is hard to explain what happened to my faith unless you have been through the process which many if not most of the people who read these threads have been through so I hope what I am feeling comes across coherently. Perhaps its best to give an example. When I was serving as deacon an emergency meeting was called. There was a member of the church living with a man and they were not married. Both of the people were divorced and they started a new relationship with each other (neither had known each other when previously married). The pastor promptly wanted to nip this in the bud because they were living in sin. That is pretty cut and dry from a biblical point of view, you can't have martial relations outside of marriage. I was on board with the pastor's view on this. The problem came a few weeks later. After confronting them about living with each other they explained that they were in love and that when they were married they weren't Christians. They wanted to start a new life together according to the bible and be married. The woman in this situation was in an abusive relationship before and she had to leave for her own safety. The man was a really nice guy and I was happy for them that they wanted to "do things right". The deacons met again to discuss this. The pastor said he would not permit the marriage, at least not perform the ceremony, because the bible says they should reconcile with their spouses and any remarriage would not be biblical. I thought, no way the bible says that. The woman was being beaten and the bible says she should crawl back to her ex and reconcile in lieu of entering a Christian relationship with this other guy? To make a long story a little shorter, after many discussions and hours of study on this subject I realized that the bible is not clear on what to do. Many have strong opinions on this and as many have strong opinions the other way. It set really bad with me. Here are a group of Christians trying to do the right thing by going to the bible and seeking answers and what we got was a bunch of convoluted instructions that you couldn't make sense out of. The thing that really got me was that the self righteous pastor said that his way of looking at it was the right way and that we didn't have the right interpretation. Really, come on. I can pull up many brilliant scholars who would argue against him but god was only speaking to him and he was right? He refused to marry them, they went to another pastor and they got married. The funny thing is that couple rejoined the church after getting married and the pastor who refused to marry them accepted them back. That is bull crap. I mean come on, if you are going to take such a stance and god is speaking to you stick to your guns. The bible says to not associate with Christians living in sexual sin. If he didn't think their marriage was valid why would he accept them back? I think he realized that his interpretation would alienate him from more than half the congregation and he backtracked. My point here is that a Christian life is full of these vague instructions. The bible quite frankly is unclear on most things and leaves these big life decisions up to interpretation. There are many examples but that is the best illustration I can think of. The bible says that god gives wisdom if you seek it. It also says god is not the author of confusion and that if you seek the lord you will find him. I put my faith in these promises and found that there was nothing there. The church is full of people muddling through a bunch of nonsense and trying to make sense out of it. I just couldn't make excuses for this flimsy belief system anymore. Never mind the countless prayers that went unanswered. When you read the bible you see that Jesus converted people through his power and miracles. It says many times that people believed because of the miracles they witnessed. Where is that power now? Why aren't people being healed? Are we asked to have greater faith than the apostles who followed Jesus after they witnessed his miracles but we are given nothing to go on but vague instructions and we are supposed to follow without question? This sounds morbid but I have a picture of a little girl in the last stages of cancer. I pull it out sometimes to remind myself of the absence of god. She is writhing in pain in the picture. Where is god? There is no healing or protection for a Christian just the sheltered bubble they create for themselves. I have heard the same old crap, we are sinful and death is the penalty for sin. Crap, Jesus was healing people and said we would have power if we sought him. There is no power, Christians are just as powerless as the next guy, there is nothing there. The bible says that we would do greater things than Jesus, that was quoted as being said by Jesus. I can't even get a prayer answered let alone heal someone. I can't even give advice as a deacon when I turn to the bible for answers that aren't there. I am still leaving the door open to god if he is out there but I can't any longer prop up a powerless belief system. The bible says that with the faith the size of a mustard seed we can move mountains. I poured my hope and faith into the bible but I was powerless to move a pea let alone a mountain. There is no power in Christianity outside what we as humans give it, there is nothing outside ourselves which gives power which we are not able to supply ourselves. I have lived this for almost thirty years and it proved itself false. 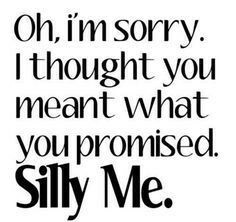 The bible promised many things but I was left with broken promises and false hope.